Citizens signal their support for clean energy at a recent meeting of the Dept. of Environmental Quality’s Clean Power Plan stakeholders group. The shift to a clean energy economy in Virginia faces many obstacles – extreme mining, extreme drilling, and apparently extreme legislating. Weeks after the 2016 General Assembly’s regular session adjourned, opponents of clean energy progress attacked state climate policy in an unorthodox way: through the budget of the agency tasked with preparing a state plan to cut carbon pollution. 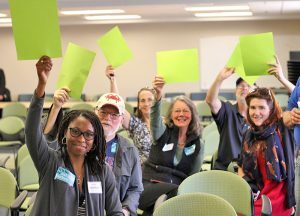 Those budget provisions will take effect July 1, and that’s unfortunate, but it’s not stopping Appalachian Voices and other organizations and clean energy advocates from continuing to push for a transition to wind, solar and energy efficiency. Let’s take a step back and see how we got here. But first, a quick primer. In August 2015, the U.S. Environmental Protection Agency passed the historic Clean Power Plan, the first federal rule to reduce carbon pollution from the nation’s fleet of coal-fired power plants. Based on years of research and public feedback, the rule establishes a series of deadlines, as well as individualized reduction goals for each state, and provides a framework for states to devise their own plan for how to get there on time. The rule was immediately challenged by the fossil fuel industry and their political allies, and earlier this year the U.S. Supreme Court temporarily stayed the rule pending further review. At stake in this past Virginia legislative session, as it was in the 2015 session, was control over the state plan to implement the federal Clean Power Plan., and whether the General Assembly would wrest that authority away from the governor. Bills mandating that the legislature approve a state plan prepared by the Department of Environmental Quality (DEQ) were introduced and approved, with highly charged rhetoric and dire claims of skyrocketing utility bills used to justify the power grab. Governor Terry McAuliffe vetoed these bills, for the time being preserving his administration’s opportunity to produce a strong carbon reduction plan on time. Meanwhile, an official stakeholders group convened by DEQ began working through many fiendishly technical areas, from the pros and cons of basing standards on emissions rates versus using an overall statewide cap, or mass-based plan, to the thorny socially oriented questions like how the state plan can yield the most benefit for low-income Virginians and what approaches would yield jobs where they are needed most. But as it turned out, the struggle to uphold administrative authority over the process was not over, and it continued into the spring when a budget amendment (369#1c) was introduced that would ensure that funds for DEQ to plan state compliance with the Clean Power Plan be withheld. The budgetary tactic was unusual, sidestepping the responsibilities that normally rest with each branch of government. The legislature was becoming involved in a matter delegated to the executive, not ordinarily within its purview, by going after the “purse strings.” This break with tradition may be viewed as a symptomatic part of a larger, multi-issue partisan divide. Amid murky intricacies of the Constitution of Virginia, Governor McAuliffe did not exercise a full veto of the budget amendment, but rather made a line item edit, striking a reference to using funds “for planning” state implementation of the new standards. The prospect of upholding this fix was slim, requiring 51 votes out of 100 members of the House of Delegates, spelling real trouble for the state’s formal planning process, which was on track to produce a draft outline by early summer 2016. As expected, the amendment language prevailed, revoking DEQ funding as of July 1, 2016, for state planning. As energy markets continue to shift, our sources for generating electricity need to diversify, and the change is underway. From the proliferation of solar arrays on Virginia homes and small businesses to mid-size and large projects at data centers and universities, examples bear out the proven economics of renewable energy. According to the Energy Foundation, Virginia has seen an increase in jobs in the solar energy business of 157% since 2012, and this is a field that is immune from outsourcing, like home energy efficiency assessment and retrofitting. The state DEQ is first charged with ensuring adherence to pollution limits in Virginia. However, the scope of its work has extended to consider the policy impacts of how air and water pollution are reduced, from the cost savings or increases to energy customers to the reliability of the electric grid over time. Perhaps no aspect of the issues that DEQ deals with is more deserving of its attention than the environmental justice implications of these rules. Areas of Virginia that have been burdened by job loss, disproportionately high energy bills relative to household income, and extractive activities that carry environmental risks deserve immediate attention. While these communities should be directly involved in designing a just and beneficial state carbon-reduction plan, political grandstanding may shut down the planning effort altogether. Leaders that operate by rigid, lock-step dedication to polluting industries are clearly missing opportunities to act in the interest of the people they represent. DEQ may yet be able to carry out work with similar aims to the Clean Power Plan in the absence of the planning funding. The agency intends to meet new rules for the energy sector, as Director Paylor made clear in remarks made during public stakeholder meetings, and Governor McAuliffe has stated support for this approach and will still have a chance to leave a robust legacy in that regard. But there is uncertainty over Virginia’s ability to have a plan by the EPA deadline. If we fail, a federal plan will be imposed, without the same level of public input in Virginia. In that situation, there will be a greater need than ever for citizens to engage with the administration and with our legislators to pursue a clean energy future in the commonwealth. Just as a strong majority of Virginians expects government officials to take meaningful action to address carbon pollution, national polls reflect that the Clean Power Plan is popular – even in states that are suing over the plan. And just as there are opponents in Virginia, including elected officials who put politics over people and use red-herring arguments to justify calling off the planning process, there are opponents who have sued over the EPA’s rule. The legal challenges were filed in the U.S. Court of Appeals for the D.C. Circuit, which would normally hear it before a panel of only three judges.But the process has been changed for this case, likely due to the significance of the issues involved, and it will now be an en banc hearing with at least nine judges presiding. The court will meet September 27, which sounds like a delay from the previous hearing date of June 2, but since the full court might have asked to review the decision, and prolonged the process anyway, this change may actually streamline the case. Meanwhile, in Virginia, as the planning funding restrictions draw closer, watch for news in Virginia as to how the McAuliffe administration plans to move forward with Clean Power Plan planning. Hannah is a life-long Virginian and serves as the campaign coordinator for Appalachian Voices' Virginia program.